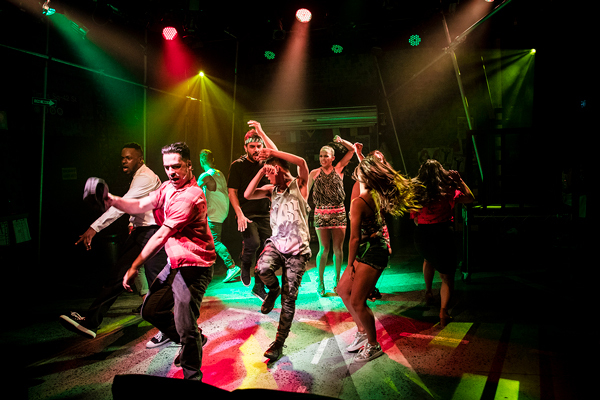 Actually, it is just the lucky few organised ticket buyers of Sydney who will be introduced to In The Heights, as the current season, at boutique venue Hayes Theatre, sold out before it opened. Like all international cities, change is a constant in Sydney; developments spring up and neighbourhoods change their identity. 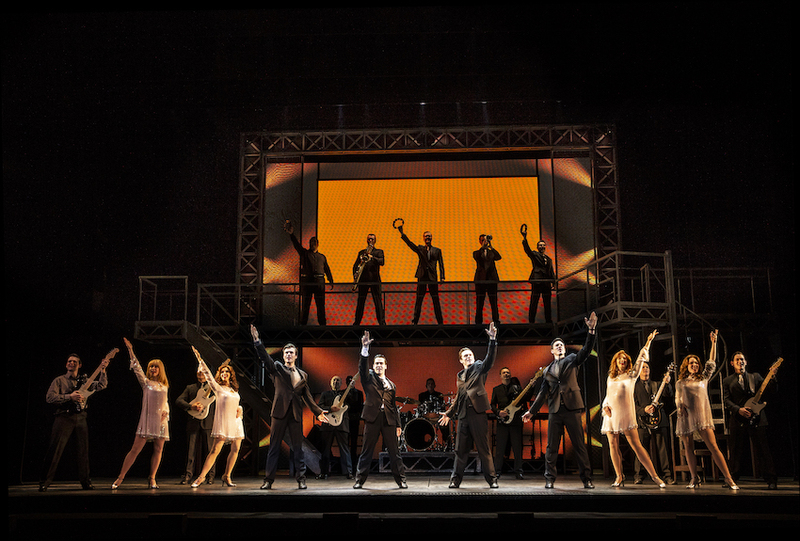 Sydney also has a multicultural vibrancy, and both of these aspects mean that the themes of In The Heights are a very good fit for the city. 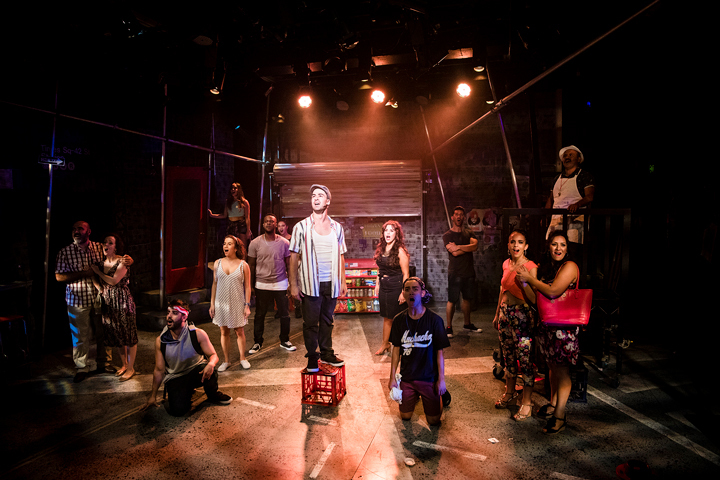 The brainchild of wunderkind Broadway composer/performer Lin-Manuel Miranda, In The Heights’ profile benefits from the zeitgeist of Miranda’s Hamilton, but is a distinct and cleverly conceived musical in its own right. Miranda is joined by book writer Quiara Alegria Hudes in crafting an highly engaging set of characters whose voices and stories ring true. 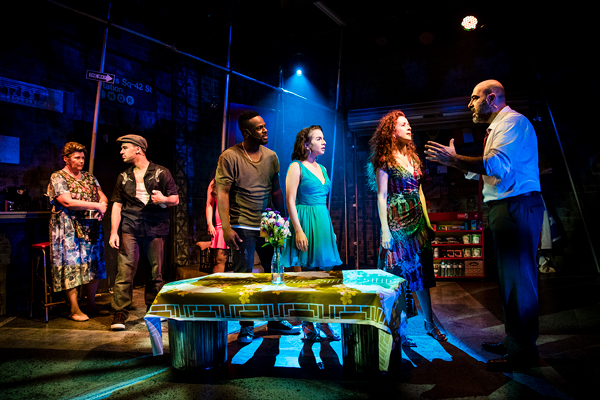 While the original New York staging drew on a larger contingent of Hispanic actors, local producers Blue Saint Productions have matched the 2015 Melbourne cast in terms of cultural fit without compromise. The high-power show has significant impact in the intimate Hayes auditorium. Sound designer Anthony Lorenz strikes a deft balance between vocals and instrumentals, and the detailed lyrics are heard with clarity. Simon Greer’s detailed set design makes excellent use of the space, housing just a representative element of each of the local businesses and creating a sense of depth with diagonal side scaffolding. Director Luke Joslin shows a sure hand with the material, guiding the audience through the dense, rapid-fire lyrics by ensuring key exchanges are front and centre. The colourful family of characters is clearly established with memorable distinction. Joslin keeps energy high, while keeping one foot on the ground, so to speak, for moments of poignancy and tenderness. Working with some extremely talented dancers, choreographer Amy Campbell adds to the explosive energy, particularly in thrilling company numbers such as “96,000,” “The Club” and “Carnaval del Barrio.” These numbers features Miranda’s writing at its very best, with dazzling use of intricate counter melodies and breakneck rhythms. Staging for “The Club” adds an extra level of visual interest, in that the rear wall is parted to show musical director Lucy Bermingham and six fellow musicians who are bringing the infectious score to life with such joy and panache. Chaos ensues at the nightclub when the sizzling weather brings a “Blackout,” giving expert lighting designer Trudy Dalgleish the chance to create an impressive effect, when revellers in the darkness are gently lit by the colours of fireworks exploding high overhead. Costume designer Elizabeth Franklin strikes a neat balance between the natural and the highly theatrical, aiding the brisk storytelling with a well chosen key look for each character. Each of the performers is very well cast, and the performances coalesce for an authentic air of community spirit. As with the polished instrumentals, Bermingham has ensured that the vocals are performed with the degree of confidence and flair that usually comes after months of performing a new score, especially one as challenging as this. 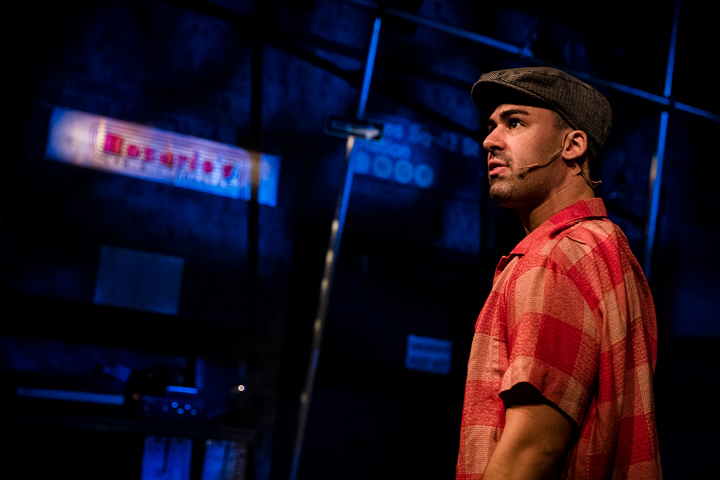 Ryan Gonzalez gives a terrific breakout performance as Usnavi, generating abundant warmth as the bodega owner at the heart of community in this little corner of Washington Heights. 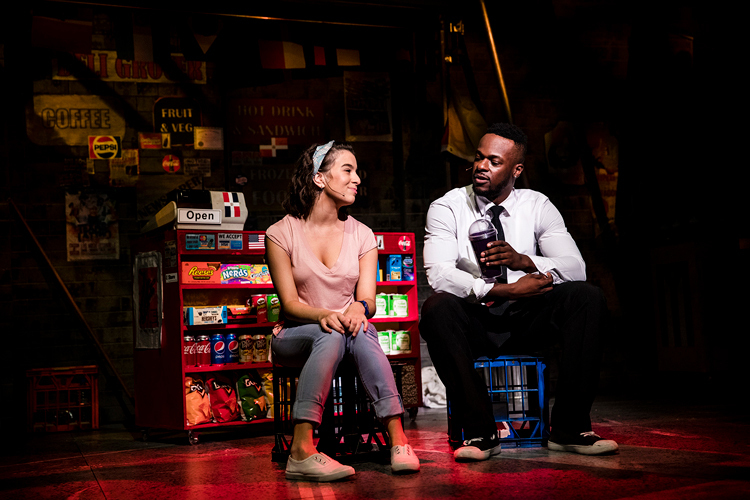 A terrific dancer, it is very amusing to watch Gonzalez perform Usnavi’s restrained, modest dance moves as he tries to impress longterm crush Vanessa at the nightclub. Recent graduate Marty Alix has an elfish sprightliness that makes Usnavi’s young cousin Sonny all the more adorable. Luisa Scrofani has an open frankness that facilitates a strong audience connection to the young woman’s familial, financial and academic struggles. Tim ‘Timomatic’ Omaji brings a thrilling energy to Nina’s suitor, Benny. Margi de Ferranti captures the earthy tenderness of weary Abuela Claudia, a longterm resident who is loved dearly by all the locals. Monique Montez brings a delightful sparkle to gossip-hungry salon owner Daniela. The standout of the supporting characters is Ana Maria Belo as Camilla, steely matriarch of the Rosario family. Belo crafts a unique characterisation for the determined woman, who can potentially be portrayed as merely long suffering. Belo’s Camila knows her mind and is not afraid to speak it, but has a heart of gold, with all her actions underpinned by a burning love for her family. 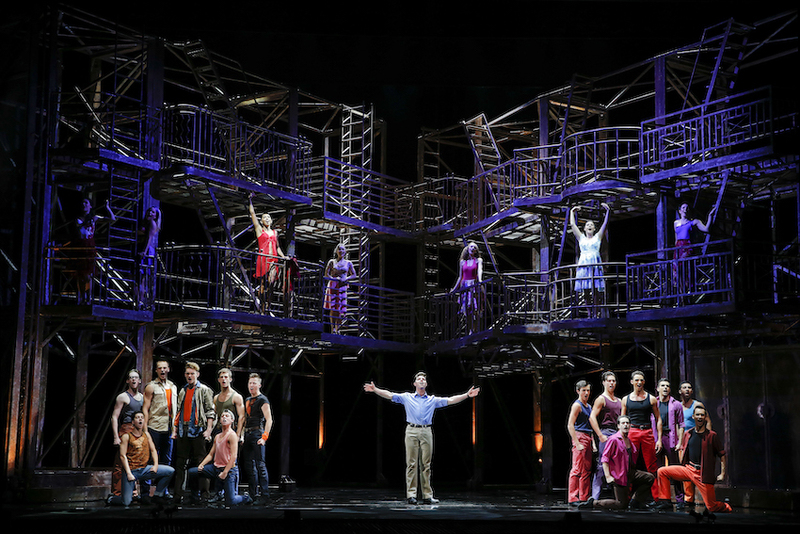 Unlucky theatregoers who have missed out on this season of In The Heights should light a candle and hope for a return engagement. 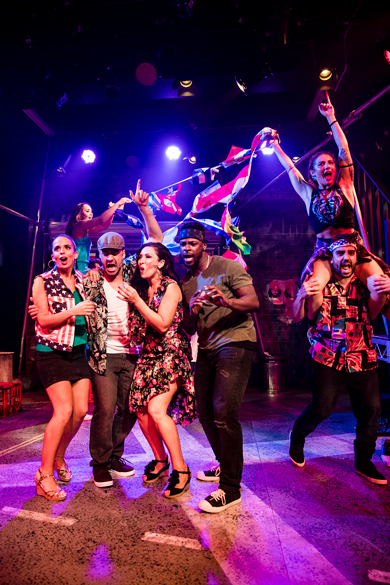 In The Heights plays at Hayes Theatre, Sydney until 15 April 2018.